With due apologies to the city and townspeople of Fargo, North Dakota, it is a safe bet that the city is mostly known in Louisiana due to the 1996 Academy Award winning "Best Picture" of the same name and by geeky people with college degrees in geography. The city, though, has better attributes. With a population of a little over 220,000 (when associated with Moorhead, Minnesota) it comprises a U.S. Metropolitan Statistical Area, which has to count for something special in a state that ranks 47th in total U.S. population. It is the hometown of the New York Yankee great Roger Maris and TV's Kevin Sorbo (Hercules: The Legendary Journeys). It has two international "twin cities" in Hamar, Norway and Vimmerby, Sweden. Northern geographical constraints (snow? Canada?) have spurred the growth of the city to the south of the original town, but that has worked just fine as the city is routinely listed in Money magazine as one of the most livable cities in the country due to low unemployment, affordable housing and a low crime rate. But high school wrestlers know of Fargo. They know it as the pinnacle of the freestyle and Greco-Roman wrestling season, as it is where USA Wrestling holds it national championships. Well over 1,000 high school wrestlers filled Fargo hotels last week for the freestyle and Greco-Roman events in the USA Wrestling Cadet and Junior classifications for boys and girls. It is not an easy ticket to punch. 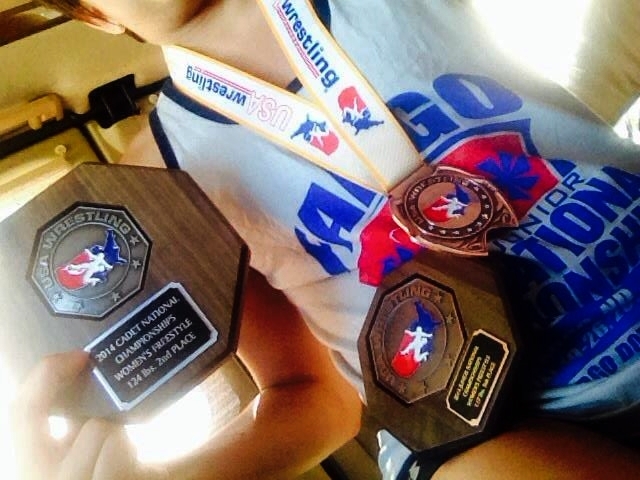 Competitors must place high enough in their freestyle and Greco-Roman state championships, or earn a spot through regional qualifying events, to earn the chance to compete with the nation's best. Team Louisiana was comprised of seven Louisiana wrestlers who qualified for the event and made the trip (more than eight, of course, qualified): Kendon Kayser (Brusly - LA D3 state champion), Josh Ramirez (to be a freshman at Rummel) and Guy Patron, Jr. (Jesuit - LA D1 runner-up) competed at the Cadet level. At the Junior level were Colt Olinde (Live Oak - LA D2 state champion), Zach Funderburk (Parkway - LA D2 state champion), Brice Duhe (Holy Cross - LA DI runner-up) and Kirk Wilson (Dunham - LA D3 runner-up). The Team Louisiana head Coach was Rummel's Jon Orillion, who was assisted by Catholic's Sheridan Moran in the freestyle events and Sammy Jones, fresh off of a bronze medal performance at the University World Championships in Hungary, who helped coach the Greco-Roman events. Doyline's Brittany Bates travelled with the women's contingent for Team Texas, as she did in 2013, which is coached by Monica Allen. Doyline coach John Smith, of course, was also present. Only one went home with "hardware" but all should say that just the experience made the trip worthwhile. These are big tournaments, with fields often several times the size to be found in Louisiana's state championships, so just competing in them is something memorable. Bates earned two more All-American honors (she now has 10) by placing 2nd in the Cadet freestyle competition and fifth in the Junior Freestyle event. Bates also competed in the Women's Freestyle Duals team event in which she went 3-2, helping Team Texas-Blue place fourth. Brittany Bates' 2014 Fargo hardware. Doyline coach John Smith and Brittany Bates at the 2014 USAW Nationals in Fargo, North Dakota. By the sheer number of wrestlers in the men's events one can afford to say placing is harder in them without being accused of sexism. In the freestyle events (which have the greatest number of participants) the smallest weight class in which a member of Team Louisiana participated had 39 entrants. Jesuit state runner-up Guy Patron, Jr. came the closest to medaling, needing just one more win to qualify for the Cadet Greco-Roman medal round. An examination of those to whom our Louisiana wrestlers lost indicates just how difficult these event are. Miss Bates lost in the Cadet finals to the event's champion, Cierra Foster of Idaho, albeit Bates scored first and competed in a heavier weight class than she had originally planned. In the Junior event her losses were to California's Dominique Parrish, the eventual champion, as well as to third-place finisher Victoria Smith. On the following day she gained some revenge by pinning Miss Smith in 3:34 in the Women's Freestyle Duals competition. 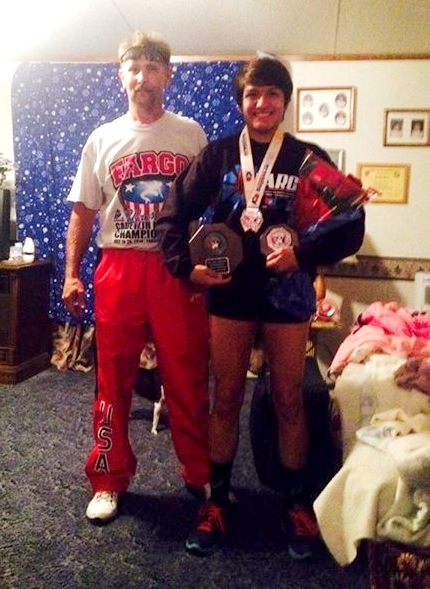 In her two losses in that event, one was to California's Gabby Garcia, who won the Junior Freestyle at 121 lbs. and was a Cadet World Champion in 2013, and the other was to New York's Sara Andresen who finished seventh in the Junior 121 lbs. class. Suffice to say one needs a stellar resume before thinking about getting the best of Miss Bates. And of all the dumb luck, in a weight class with 106 entrants (the largest in the entire week of competition), Zach Funderburk's second Junior Freestyle match was against the eventual 145 lbs. Junior Freestyle runner-up. The losses of Team Louisiana are mentioned not to exhibit any flaws in the Team Louisiana members but merely to demonstrate the caliber of competition that these wrestlers chose to compete against, which is surely to their credit. According to Archbishop Rummel and Team Louisiana USAW head coach Jon Orillion it is the match-to-match level of competition each weekend that hinders Louisiana's best when competing against competitors from other states of greater wrestling renown. At a tournament like the Fargo Nationals, or any of the larger tournaments around the country, you can expect every match to be as competitive as the state finals. According to Orillion, "Louisiana has the physical talent to be considered a great wrestling state. The problem at the national level is that most Louisiana wrestlers are not prepared to wrestle seven state-finals quality matches in a row for a national championship." Nowhere was this demonstrated better than at last month's Jazz Town Duals in which three-time defending Louisiana Division I state champion Brother Martin placed fourth behind teams from Georgia, Iowa and Indiana while also suffering a pool loss to a team from Pennsylvania. But to be exposed to that level of competition is the reason why competing in events such as the Fargo National Championships, or similar national events such as held in Virginia Beach or Delaware, is an invaluable lesson. They may not win medals, but those who show up invariably become better wrestlers come the following year.